To help you shop at The Fabric Fox we have created our very own Shopping Guide. The Shopping Guide is full of loads of useful information such as how to order the correct amount of fabric, what types of fabrics we sell, how to use your gift certificates, and much more! Please note that this is a rough guide as the fabrics can vary slightly in width. Once you have found a fabric you like click 'Add To Cart'. This will automatically add 1 Fat Quarter to your Cart. From your Cart you can decide how much you would like to buy using the Quantity box. If you only want 1 Fat Quarter leave the box with ‘1’. 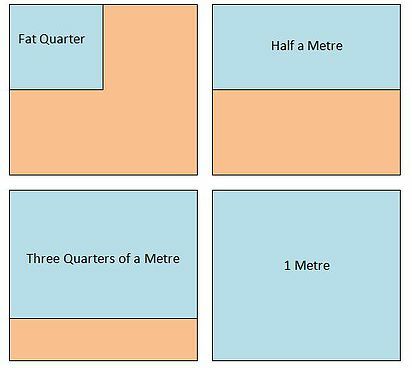 If you would like Half Metre type '2' into the box. If you would like 3/4 Metre type '3' into the box, and so on. You can refer to our chart for larger quantities. Finally, click 'Proceed to Checkout' to finish placing your order. Any amount you select will be cut as one continuous piece, unless otherwise specified. If you have a coupon code or a gift certificate you will need to apply it before clicking 'Proceed to Checkout'. In your Cart there are two boxes beneath your order summary. Place your coupon code/gift certificate in the appropriate box and click 'Go'. The coupon code/gift certificate will be applied and your total will change accordingly. Click 'Proceed to Checkout' to finish placing your order. You can also apply a coupon code/gift certificate on the Order Confirmation screen. Place your coupon code/gift certificate in the box and click 'Apply'. Fabrics on our Pre-Order page are fabrics you can order before they are in stock. Once the fabric arrives we will immediately process your order and get your fabric sent out to you. It is important to place your pre-orders separately from fabrics that are already in stock; otherwise you will have to wait until the pre-ordered fabric arrives before you will receive the rest of your order. However, if you are happy to wait we will place your fabric to one side and post it with your pre-ordered fabric. Each fabric has an estimated date of arrival. These are dates that the fabric manufacturers have given to us but they are not set in stone; there may be circumstances that are out of our control that may delay the delivery of stock. Orders of £40 or more will be posted Second Class for free. If you would like to upgrade to First Class then please select the 'First Class' option in the cart. This shipping option is only available for delivery to locations inside the UK. We aim to process all orders within 2 working days, Monday - Friday. UK orders that are posted via Royal Mail First Class post aims to deliver within 1-2 working days. UK orders that are posted via Royal Mail Second Class post aims to deliver within 2-3 working days. European orders weighing over 250g will be posted via International Tracked and Signed which aims to deliver within 3-5 working days. Orders to the Rest of the World weighing over 250g will be posted via International Tracked and Signed which aims to deliver within 5-7 working days. All international orders that weigh less than 250g will be sent by International Standard which is not tracked. We have introduced this option so that we can offer a cheaper delivery charge for smaller orders. If you would like to have a small order tracked please contact us as soon as possible once you have placed your order so we can advise you of the additional costs. Certain orders require us to use a third party postal service. UK – Orders of £50 or more will be posted 'Signed For'. We will provide you with a tracking number via email once your order has been shipped. If you place a very large, high value order we may need to use a courier and the courier will provide you with a tracking number instead. Europe & Rest of the World – All orders over 250g will have a tracking number. We will provide you with a tracking number via email once your order has been shipped. The order will also have to be signed for to confirm that the order has been delivered successfully. For orders sent outside of the UK customs charges can sometimes be applied upon receipt of your order and are the responsibility of the customer. Customs charges and rules vary by location, so please check with your local tax office for more information on additional customs charges that may apply. If any international orders cost significantly more to post we reserve the right to contact you to inform you of the higher postage cost. We will only process your order once you have confirmed you are happy with the change in price, or if you are planning on placing a large order please feel free to contact us first and we will be happy to advise you on postage costs. Once you have clicked ‘Proceed to Checkout’ log in to your account. If you don’t have an account you can create one or you can check out as a guest instead. Payments will be processed securely through our website. Alternatively, you can click ‘Checkout with PayPal’ instead. Log in to your PayPal account and follow the instructions to complete your order. If you do not have an account with PayPal you are able to create a temporary account with them for the transaction. After the transaction is complete there is the option to save your details to make future transactions faster and easier for yourself. We use a combination of stock images (from the designer/manufacturer) and our own photographs to present the fabrics we sell. All parties have tried their best to represent the colours as accurately as possible. However, we can't guarantee an exact match as colours can vary depending on your display settings, and therefore fabrics may look different upon arrival. Some of the fabrics we sell have been pre-washed but we recommend washing your fabric before using it - but please bear in mind that there is a risk of shrinkage. Therefore we recommend purchasing slightly more fabric than necessary, just to be safe. Cuts of fabric cannot be returned. Once they are cut from the bolt the fabric is considered a personalised order. However, if the order is damaged or defected it can be returned within 7 days and a full refund will be issued or an exchange can be arranged. Please contact us if you have any problems with your order before sending any fabrics back. If 7 days have gone by since your purchase, unfortunately we can’t offer you a refund or exchange. For additional information please read our Terms and Conditions.